Now I could spew my normal vitriol against what vile, cowardly nationalists these people are, but I’m not going to. The caricature of the enraged, overweight simpleton, holding misspelled signs and waving “Don’t-Tread-On-Me-Flags” has been done a thousand times over. No, the issue I want to talk about today is the insidious ideology behind both the protesters and the silent masses who’d sympathize with them. 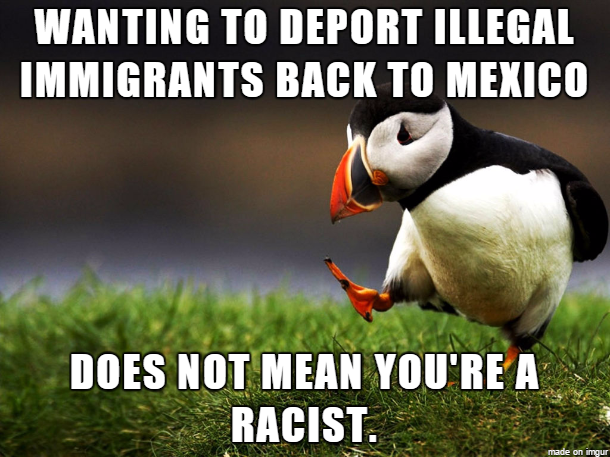 As the commenters on the image swiftly pointed out, the creator of that meme had assumed that illegal immigrants are- by definition- Mexican. This is absolutely not the case. It wasn’t the case in Murietta, and it isn’t the case in general. True, true- but it doesn’t exactly inspire confidence in your motives. The migrant crisis on this side of the world didn’t happen when a bunch of Central Americans collectively decided “Y’know what? Screw it- let’s skip into the US to take advantage of their low-paying jobs and abysmal welfare!”– it happened after thousands of people decided that making the expensive, agonizing, and dangerous journey for a chance at a better life would be better than what they had now. Which, by the way, was often staggering poverty, violence, and death. If anything, it’s our immigration policy that needs review. If making a long and potentially fatal journey is still seen by many as a more viable option than our present system, then it’s time to take a hard look at what we’re asking of people. There were also African-Americans in the 1850s who voiced support for the institution of slavery. That’s an extreme example, sure, and I’m not going to call every anti-immigration Latino an Uncle Juan, but I do want to make it clear that having a certain ethnic background is, in itself, not a strong basis for argument. I do have a tough time believing ’em, all the same, largely because of how broadly these laws get used. Pretty much every company in the US makes their employees fill out I-90 forms to verify their legality to work in this country. Trying to enforce the rules beyond that gets into some extremely questionable (i.e., openly Fascist) areas. Take Arizona’s notorious SB 1070, for example. In spite of all the defensive rhetoric of the folks demanding stronger border and immigration control, the effect of “show me your papers” laws- like “SB 1070”- is essentially to declare open season on brown people. That might sound melodramatic, but let’s face it, do these laws- in any way, shape, or form- target folks who are non-Hispanic? Yours truly, while a citizen, has only lived in the US for about seven years- the vast majority of my life has been spent overseas. Yet I have never been stopped by anyone and asked to prove my legality. In contrast, there are folks (natural born or otherwise) who’ve lived in the country all their lives, and they do get routinely stopped and harassed. What’s the difference? My skin tone’s a few shades lighter than theirs are. And that’s really the unspoken force behind these laws and our immigration policy in general. It’s the idea that America, fundamentally, is a white country. Sure, there are also African-Americans, Asian-Americans, Arab-Americans, and Hispanic-Americans, but they’re not American-Americans. Think that’s an exaggeration? Just look Nikki Haley. Born to Indian immigrants, Nimrata Nikki Randhawa has swiftly made a name for herself in politics, holding a number of impressive positions- most recently as a 2nd term governor of South Carolina. So popular is Haley among her Republican peers that she was given the honor of offering her rebuttal to Obama’s final State of the Union address, during which she offered a less-than-subtle chide to Donald “Mexicans-are-rapists” Trump for his recklessly inflammatory rhetoric. Now if that doesn’t say it, I don’t know what does. You can be an American citizen, born on American soil, hold numerous American political offices, impose your own hardline on immigration control, but the second you’re perceived as getting too “uppity”- wham! Deportation. Again, the clear message here is that the US is a white country, and that all other races live within these borders at the good grace of their Caucasian counterparts. Deportation isn’t some procedure for repatriating someone- it’s a constant threat to any non-white (Hispanics in particular) who step out of line or fail to conform. At least, that’s certainly what many Nativists (a darkly ironic term, if ever there was one) would advocate for if given the chance. Not that it’s entirely coming from a place of malice. Don’t get me wrong here- plenty of it is, but as always, bigotry is as much ignorance as it is distilled evil. There’s plenty of blame to be cast on our utterly warped sense of our own history. The story of the Southwest is, after all, generally glossed over in our textbooks except for a few stories about cowboys and the gold rush. We’re given the (completely wrong) idea that the Southwest was nothing but empty desert before the arrival of intrepid settlers, and that the presence of Hispanics was the result of some kind of invasion in the early 90s, instead of ’em having already been there for centuries. These buildings weren’t just naturally formed out of the very earth. To quote the Migration Policy Institute, “Of the 54 million people in 2013 who identified themselves as Hispanic or Latino origin, 35 percent (19 million) were immigrants.” Truth is that the former California territory, while hardly a buzzing metropolis, was still full of hundreds of native and proto-Hispanic communities, many of whom have deeper roots in this country than the very folks complaining about them. And as we covered back in 2013, there are even folks who know all this, but are still attempting to rewrite history to fit their own narrative. So what do we have in summary, folks? A heartless system that excludes of the most needy and is increasingly reliant on techniques infringing on liberty- all of which is now being (and will continued to be used) by psychopaths to intimidate and control anyone who looks different. Does wanting to have stricter border control make you racist? It’s just puts you in bad company. This entry was posted in America, bizarreness, crime, government, history, morality, news, politics, race and tagged America, Anne Coulter, bigotry, border, Bus, Central America, control, Crisis, deportation, Donald Trump, immigration, Migrant, Murietta, Nativism, Nativist, Nikki Haley, Protest, race, racism, SB 1070, SOTU, South West. Bookmark the permalink.